“Juke Joint” by Chuck Dugan. The impact of art on Alzheimer’s patients and veterans living with Post Traumatic Stress Disorder (PTSD) was discussed at the Texas Tech University Health Sciences Center (TTUHSC) El Paso’s September Walkin’ the Talk lecture. 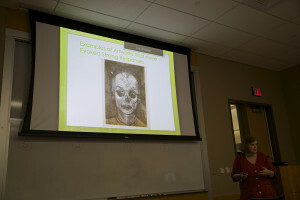 Elisabeth Sommer, Ph.D., education curator for the El Paso Museum of Art (EPMA), presented “How the Visual Arts Can Provide Relief And Stimulation” to students, faculty and staff. Dr. Sommer explained that on one occasion, paintings of coastal scenes were shown to patients, while sand and rocks were available for them to touch. The visuals prompted the patients to remember past events associated with these elements. “The senses are very powerful and stimulate synapses,” said Dr. Sommer. On another occasion “Juke Joint,” a painting by Chuck Dugan prompted one Alzheimer’s patient to state, “That’s my mind” after being diagnosed with the disease. 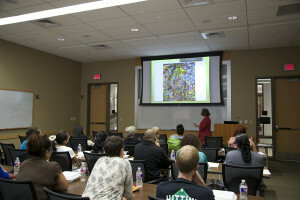 Dr. Sommer explained that the abstract artwork engages the brain to work and make sense of what it’s seeing. “Self-Portrait with Calavera” by Luis Jimenez. She said that in this instance the artwork revealed the impact of war on veterans. 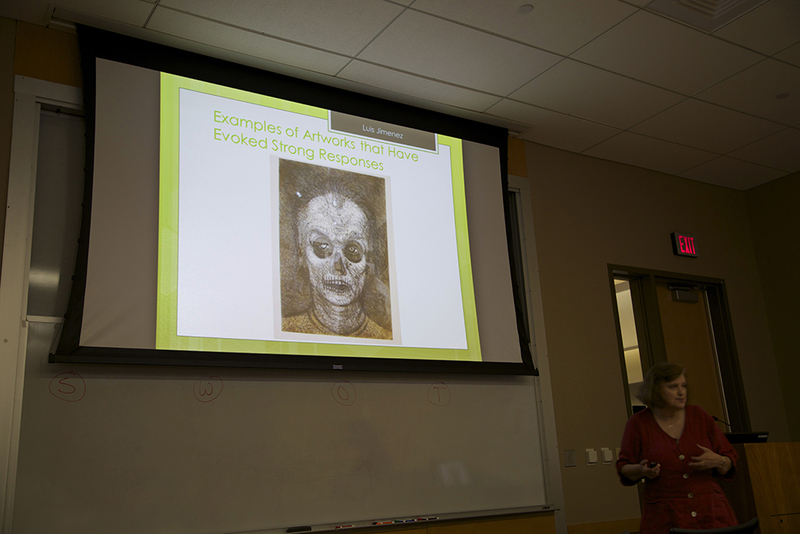 “Art is a powerful medium,” said Dr. Sommer. Dr. Escamilla teaches his psychiatry fellows to use art in therapy treatments because it encourages patients to express their feelings while finding symbols that help them work through their psychological pain. “Appreciating and responding to art activates many of the same parts of ourselves as does creating art itself,” said Dr. Escamilla.